Somerset strengthened their position at the top of the South Group after claiming their seventh win in ten games in the Vitality Blast with three balls to spare against Sussex Sharks at Hove. Sussex appeared to be in course for their first home win in this season’s tournament when they reduced Somerset to 134 for 7 in the 17th over chasing 170. But David Wiese, whose four overs were hit for 52, conceded 16 in the 18th as Roelof van der Merwe hit him for two boundaries before depositing a full toss into the pavilion. Five were needed off the final over by Chris Jordan and van der Merwe edged the second ball to the fence before hitting the winning runs to backward point off the next to seal a three-wicket win. Somerset had been well placed at 112 for 3 from 12 overs before Sussex took three wickets in successive overs which looked to have turned the tide in their favour. 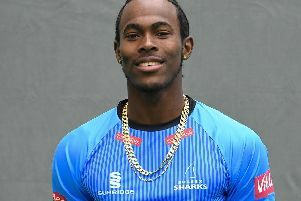 Jofra Archer’s yorker proved too good for Tom Abell (30), whose stand of 56 in 6.1 overs with James Hildreth had put his side in a good position. Danny Briggs claimed Hildreth (25) in the next over when he was stumped trying to clear the leg-side boundary for the third time before the irrepressible Rashid Khan, who had earlier claimed Peter Trego (14) with his first ball, bowled Lewis Gregory with a fizzing leg break. Khan had figures of 3 for 29 when Corey Anderson (14) was superbly caught by Chris Jordan at long on. Sussex appeared to be in control but van der Merwe’s unbeaten 33 off 18 balls, with three fours and two sixes, proved decisive. Earlier, Laurie Evans had top scored with 96 in Sussex’s 169 for 5 after they had been put in. Evans fell off the penultimate ball of the innings trying to clear mid-wicket for the boundary that would have brought him his hundred. Instead, he had to settle for a career-best which included ten boundaries and two leg-side sixes, off Overton and Jamie Gregory, as he dominated a Sussex card where the next best score was Tom Bruce’s 21. As well as some powerful blows on both sides of the wicket he also ramped successive deliveries from Abell to the rope. Evans now has 343 runs in this season’s competition. Somerset’s spinners Max Waller and van der Merwe were the pick of their attack. Waller bowled Phil Salt (5) in the first over and also had Delray Rawlins (18) stumped when he too came down the pitch to the leg-spinner. Somerset’s quicks liberally used the short ball on a pitch offering decent pace and carry, often to good effect. Luke Wright (5) pulled Gregory’s bumper to deep mid-wicket and Jamie Overton was successful when he dropped short and New Zealander Bruce was held at deep cover after making his highest score in this season’s Blast. Sharks top scorer Evans said: "It was difficult to assess what a par score was. The pitch had a bit more pace than some we’ve played on but we haven’t played on too many great wickets at Hove and haven’t won here yet, so that is something we need to put right in the last three games here. It suits our attack to have some pace on the ball but we’re not making excuses, the pitch is the same for both sides. "With the bat, I honestly don’t really feel I have got going yet. I’m not hitting slower balls as well as I can and even at the end I felt I could have got a few more but I’ve got a different role at No.3 with others batting around me so I’ll take 96 and hopefully there are a few more runs to come. "We’re still in a good position, one we would have taken at this stage had we been offered it at the start of the competition. We probably need to win three out of five but with hard work that is achievable."